Hey crafty friends! Today I joined arms with Expressions Vinyl to share a fun Back to School project with you, these cute kids t-shirts will have your kiddos looking sharp as a pencil! 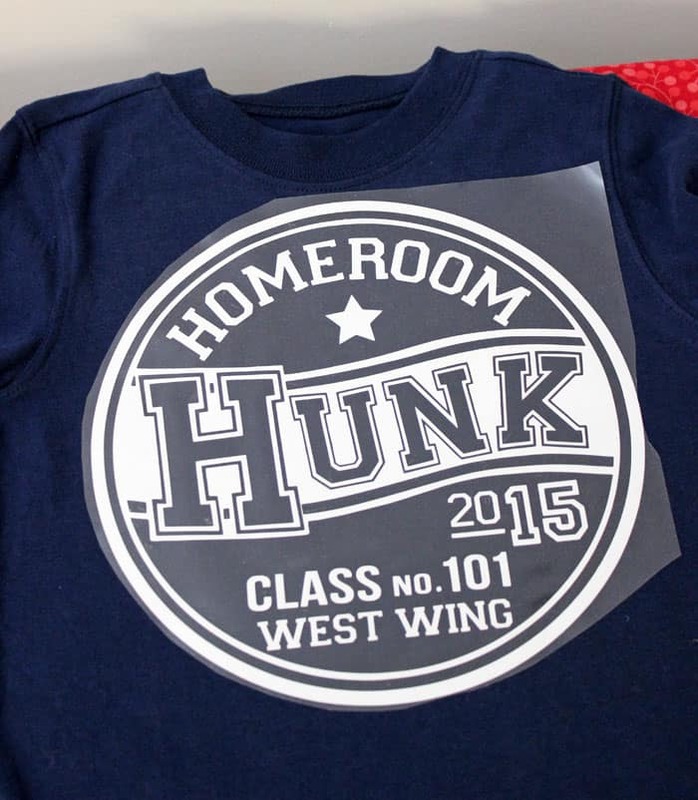 With the exception of the Santa Sacks I created last Christmas, I haven’t used Heat Transfer Vinyl (HTV) very much. I was a bit hesitant about diving into creating some t-shirt designs for my kiddos, beause I didn’t want to ruin the shirts. But the verdict is in, and I’ve found a new addiction; I’m going to be cutting up HTV like nobodies business! If you haven’t tried HTV yet, you can read some great step by step tutorials over at Silhouette School, The Pinning Mamma, and Crazy Little Projects. HTV so easy to use, you just need to be sure to mirror the image, set your blade to the appropriate depth (the program will tell you), and be sure you’ve loaded the product with the plastic side down before pressing cut. Weeding the material is a bit tough, but once you find good lighting to see the fine lines, it comes off no problem. Unlike vinyl, it won’t stick to itself, it usually comes off in one big piece… so weeding isn’t really that tough, ha. TIP- When using glitter HTV if you can’t see where the next line to peel from is, if you stretch the lifted side a bit you’ll see exactly where the cut is. The Class Cutie file I broke into two colors (I’ve separated the pieces for you in the download). You’ll just need to cut the centre from the plastic of the starburst so you can put the text in. Don’t forget to keep the plastic from the starburst so you can replace it for ironing the whole piece together. HTV does not withstand the heat of the iron without the barrier of the plastic. You can also use a sheet of parchment paper. Aren’t these shirts great?! I have a couple cuties that will be sporting these fun designs. Expressions Vinyl has so many heat transfer colors to choose from your t-shirts can be so unique! I love sharing my cut files with you for FREE, I’d love a share on social media in return. 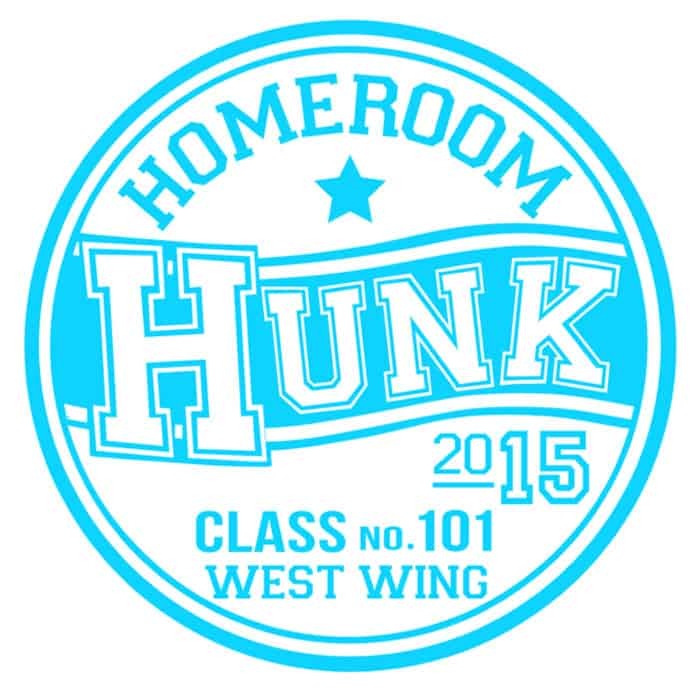 Download the Homeroom Hunk Cut File HERE. 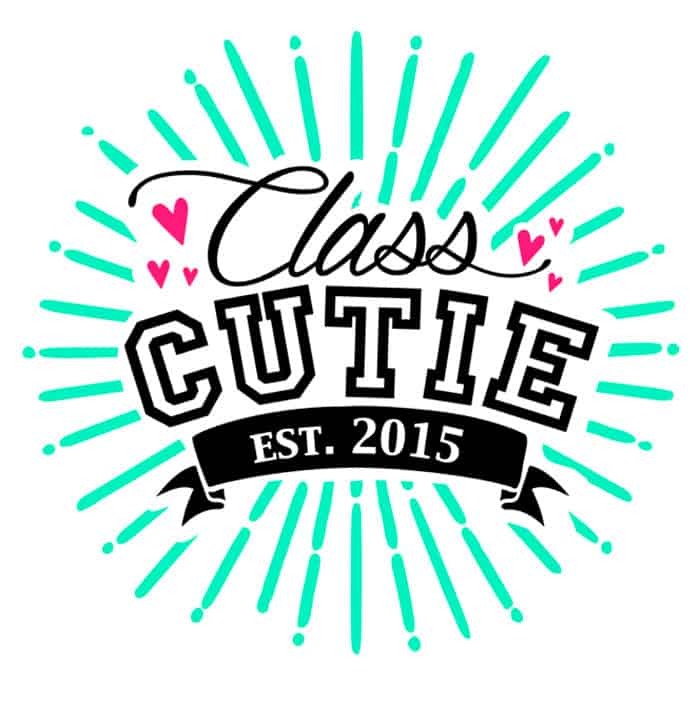 Download the Class Cutie Cut File HERE. 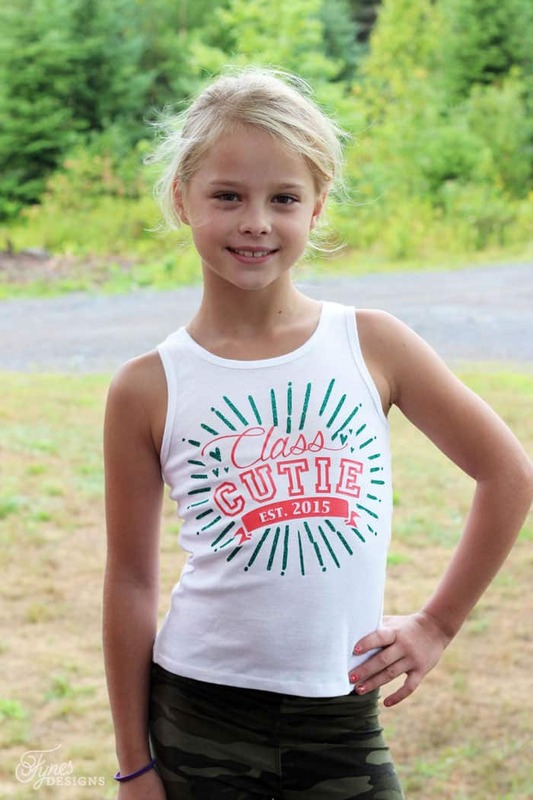 Want to get creating your own cute kids t-shirts, and give HTV a try? Thanks so much for joining in on the fun today! Please note these projects were created as a part of the Expressions Vinyl Ambassador Team, all ideas, creations and opinions are 100% my own. Love these files! Thank you so much!! I love them! Thank you so much…I can’t wait to make some T-Shirts for my kiddos. Thanks so much! My own ‘hunks’ & ‘cuties’ are out of school 🙁 but i have some nieces and nephews that are going to love this! Ha!! 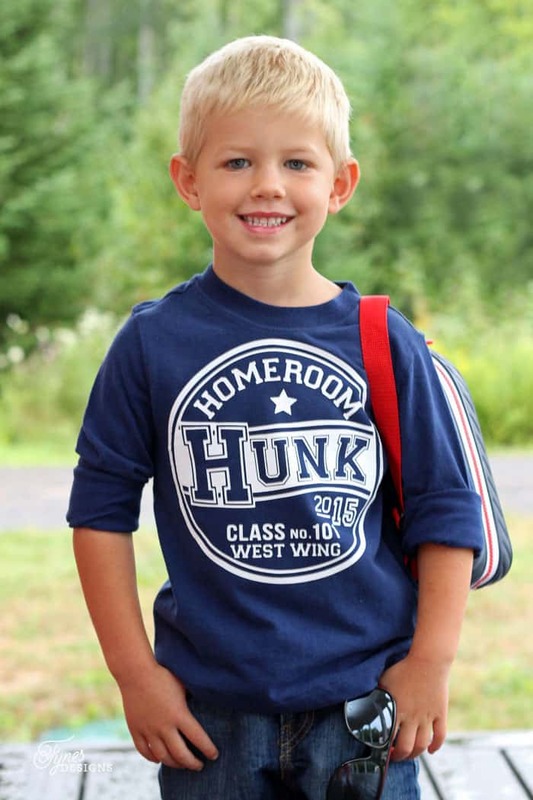 Don’t think your adults would want to be hunky? ha, I’m sure your other littles would rock it! Thank you for the cute files!!! Thank you!!! LOVE these!!!! Would love a version of the boys one for the girl!! Great idea, Never thought of that! Thank you so very much for the designs! I am a newbie just getting started and it is so wonderful that you gave hints, directions and free designs! Good luck Sandy, you’re going to love it!! How can I change it to say 2018?